Lawmakers took a number of steps recently to protect the integrity of public assistance programs – including passing a bipartisan bill I sponsored to protect against trafficking of Supplemental Nutrition Assistance Program (SNAP) benefits. 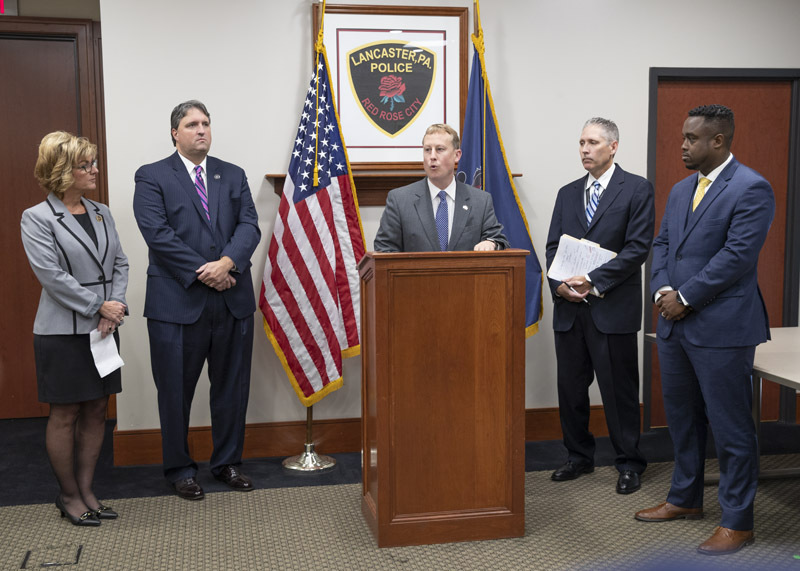 I recently joined Pennsylvania Inspector General Bruce Beemer, Lancaster County District Attorney Craig Stedman and Representative Mindy Fee at a press conference to outline the collaborative efforts to protect SNAP from fraud and abuse. Inspector General Beemer and District Attorney Stedman outlined a new partnership to help identify and prosecute SNAP trafficking cases under the new law. The agreement will also expand the Office of Inspector General’s partnerships with the United States Food and Drug Administration, the Food and Nutrition Service, and the Department of Human Services to combat trafficking and fraud. This innovative partnership at all levels of government demonstrates the importance of preventing the abuse of taxpayer-funded programs that help our most vulnerable citizens. Additional details, including full video and information from the news conference, are available here. Communities throughout the country will join together this weekend on Veterans Day to honor the service and sacrifice of the men and women who have served our nation in the military. The Lancaster County Recorder of Deeds has created the “Thank A Vet” discount program will help organize local merchants to offer special discounts on purchases and services for veterans. The Recorder of Deeds will offer a free photo ID card to Lancaster County veterans who wish to participate in the program. Details on the program are available here. A list of participating merchants is available here. Pennsylvania law requires motorists to stop at least 10 feet away from school buses when they have red lights flashing and the stop arm extended. A bill that was signed into law recently will help capture offenders who ignore stopping requirements by allowing for the placement of cameras on school bus stop arms. Violations of the school bus stopping law can result in a $250 fine, 60-day suspension of driving privileges and 5 points on the offender’s driving record. More information on school bus safety for both motorists and passengers is available here. Additional information about the new law encouraging the use of stop arm cameras is available here. Many older Pennsylvanians are at a higher risk of suffering from depression and loneliness. A nationwide non-profit group offers a toll-free crisis intervention hotline that allows volunteers to speak with isolated seniors who require emotional support. The Friendship Line is available to people age 60 or older, as well as adults living with disabilities. The program accepts both incoming calls and outreach to monitor the health and wellbeing of older community residents. Although winter is typically considered to be the most dangerous driving season for motorists, the fall season presents a number of unique challenges as well. Hazards such as wet leaves, deer, frost, fog and sun glare can create dangers that are every bit as serious as snow and ice. PennDOT offers a number of tips to help motorists navigate the dangers of the fall driving season. More information is available here.